This snow scene was shot only a few hours later than my gazebo shot from yesterday. I literally went to bed just before midnight,tossed and turned as I thought about scenes to capture and climbed out of bed before 4am to head out looking. 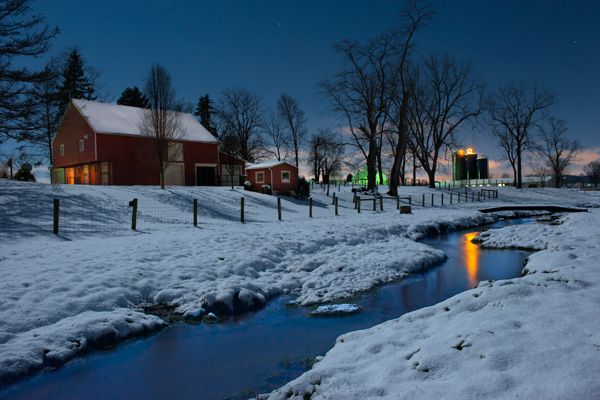 Again the full moon had the landscape lit up as evidenced by this shot taken around four thirty in the morning.A farm with silos glows in the distance as a bright star on top reflects in this peaceful stream.If you look closely,you can see stars in the night sky. This entry was posted in Amish, Christmas, Close-up, Landscape, Photography, Snow, Winter and tagged Christmas, Farm, Full Moon, Glowing, Landscape, Photography, Snow, stream, Water. Bookmark the permalink. Don—-I need to take a nap after reading the back story on this photo, but I really enjoy looking at the photos that result from your energy and zeal !!! Very nice photo…but your title was misleading…I thought it was going to be a baby picture of you! I was going to use my picture,but I was so adorable and still am by the way,but I figured everybody would comment and I would be replying all day long.